Bioshock Infinite: Burial At Sea Episode 2 continues the story of Elizabeth as she seeks to right the wrongs committed by Comstock, and tracked the last one to Rapture. It opens up with her in Paris enjoying the neighborhood, and not only does she receive a portrait of herself but everyone in the neighborhood knows her. She sees a little girl, Sally, and has the urge to follow her, and as she does so the weather starts to become darker, and then the scenery starts to change. 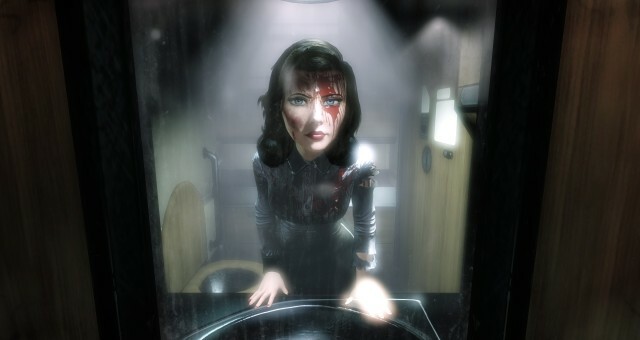 Elizabeth recalls she’s not in Paris, and she’s brought back to her senses in Rapture where the first episode ended near Booker’s body. She’s watching Atlas and his men scour the area and loot Booker’s body, and she’s unsure of what to do until she hears Booker’s voice on the walkie-talkie. He tells her to convince Atlas that she’s valuable and can give him information in exchange for her life and the girl, and in return she’ll help Atlas escape. He agrees to these terms and she continues on her way trying to piece together everything that happened, and she’s utterly shocked to stumble on her own dead body. It all comes back to her as she recalls she was killed by the same Big Daddy that killed Booker, and when she looks at her hand she sees her fingertip has been restored so she’s no longer able to create tears and is cut off from the greater understanding of these events she once had. She still hasn’t saved Sally and since she doesn’t have her powers anymore how can she fulfill her promise to Atlas? To do so she’ll need more than Booker’s voice, which is really just her own inner voice, to guide her. I was very intrigued by the story in episode 1, especially the conclusion, but less impressed with the actual game play as most of it felt like a regular shooter since Elizabeth’s tears weren’t available until late, and so it didn’t feel like Bioshock Infinite. The story started off even more shocking and intriguing this time around, and right away the game play didn’t feel like Bioshock Infinite but it didn’t feel like the first episode either, and that’s a really good thing. Clearly Elizabeth is not Booker/Comstock, and so she wouldn’t be able to go guns blazing in every situation or even sustain the same amount of damage. And since she no longer has access to tears, the game relies on stealth throughout. So in order to make it work a few new gameplay mechanics have been added, and I was surprised at how well this was pulled off. Various materials have been added to the environment so you have to be mindful of where you walk as stepping on glass will make more noise than any other material, and crouching allows you to move silently. This even extends to hooks you can use in the walls and ceilings because they will creak if you stay on them too long and you can perform silent landings to take out an enemy from behind. Lock picking is now a gameplay mechanism and you have to be quick to select the right pins so an alarm isn’t triggered, and lock picking isn’t just to open doors but disable turrets too. 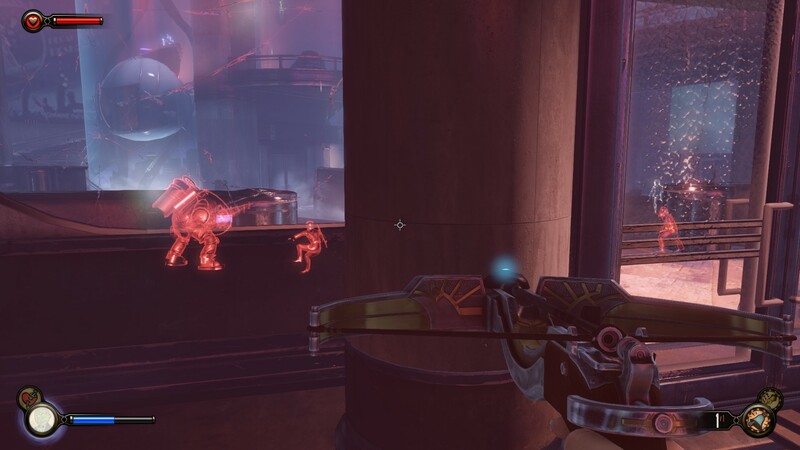 The changes apply to combat as well, and the first weapon you receive is a crossbow with knockout bolts, and as the episode advances you’ll acquire other bolts all suited for stealth or distraction. Yes you do acquire a few of the usual guns but Elizabeth is considerably slower than Booker so her reload speed is too slow for you to hope to win in a shootout against multiple enemies. And since her melee attack doesn’t cause any damage when an enemy is facing you, and only stuns briefly, you can’t overpower the enemies you face. And the story does an excellent job in raising the stakes and making you feel engrossed in the stealth aspect because it’s explained through the Luteces that she’s cut off from the others so if she dies that’s it. Fortunately Elizabeth does have access to Plasmids, and they’re perfectly suited for her and a hell of a lot of fun to use and try the different combinations. 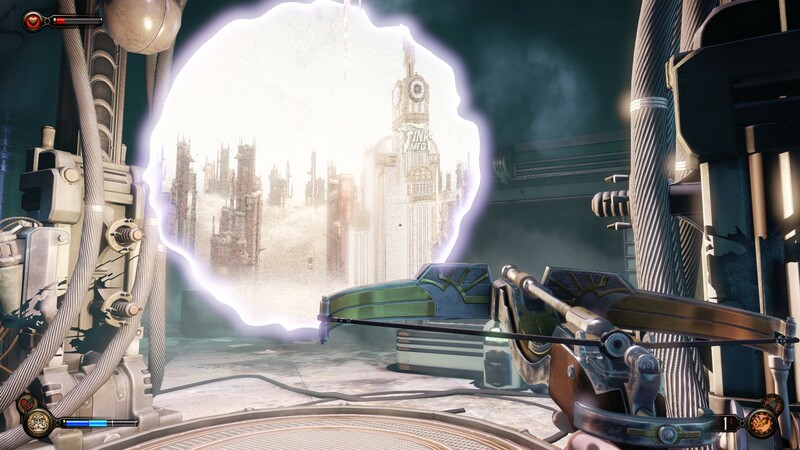 One Plasmid, Peeping Tom, is crucial as it’ll let you detect all enemies and their movements through walls as long as you’re stationary, and it’ll allow you to become invisible for a time to get past more difficult targets. And since the Big Daddy that killed Elizabeth and Booker is still walking around and cannot be killed, it’s important to know where it’s at whenever you have to pass through that room. Possession, which allows you to turn an enemy against others, returns and it’s a requirement to use it against the Big Daddy at times since you can’t do anything else to it. It’s pretty thrilling to sneak around so you don’t get caught by the Big Daddy but it’s also enjoyable to possess it and have them fight among themselves and let the Big Daddy take all of them out. Old Man Winter, which freezes people and items, and Ironsides, which stops bullets and adds them to your supply of ammo, are both useful in various scenarios. I found myself having a lot of fun laying out Plasmid traps even if I had to repeat a sequence and try again because they were that cool to use. I was somewhat excited about the return to Rapture for the first episode but when I thought about it later I wondered why the choice would be made to revisit Rapture when the ending of Bioshock Infinite left the door open for an infinite number of locations. Or to take a quote directly from this episode, “all these infinite universes yet we end up going down the same path.” This Elizabeth wondered that as well as she tried to recall why she was here, and in a way that allowed things to feel fresh. 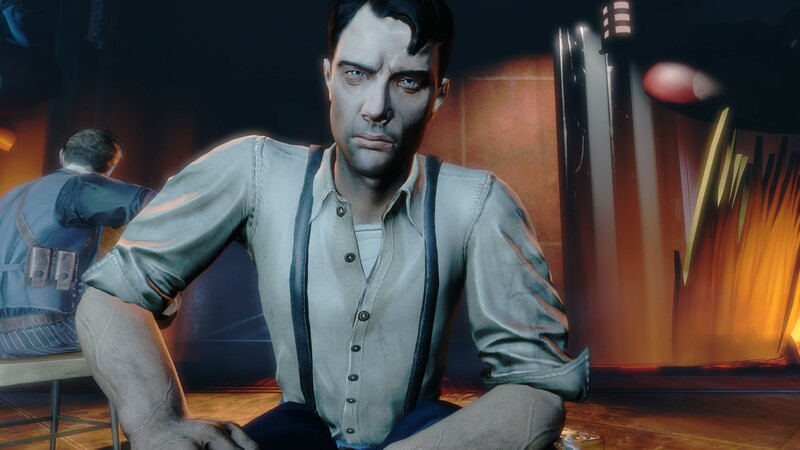 The story tries to connect all the events from the previous games, and despite one being able to follow the events taking place without playing the original Bioshock, what unfolds is definitely more rewarding for those who have played it. Without giving away any spoilers you do make a return to the city in the clouds so the Bioshock Infinite story line isn’t abandoned completely. And even though the conclusion to this episode was very satisfying just that visit alone made me think of so many possibilities. Bioshock Infinite: Burial At Sea Episode 2 is an entertaining episode that completely revamps its gameplay so it’s suited for Elizabeth and her current situation, and succeeds in creating engrossing game play mechanics and story. The story does an exceptional job in tying together all the Bioshock games but it’s definitely an experience that’s more satisfying for those who’ve played the previous games, and those who only played Bioshock Infinite might wonder what happened to that gameplay also. If you enjoyed the first episode you’ll love the conclusion in this one, and I recommend episode 2 for a more complete Bioshock experience.